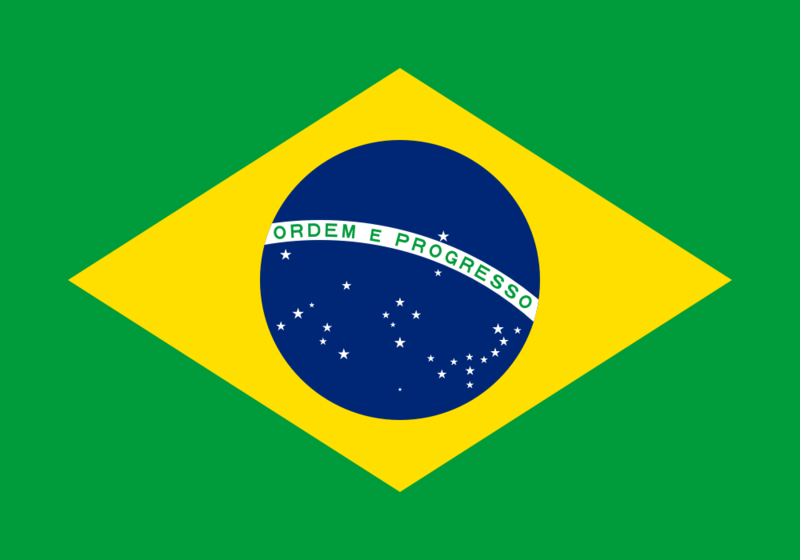 The flag of Brazil is one of the most interesting flags. It features a field, a rhombus, and a globe with a starry sky. It also has the national motto “Ordem e Progresso,” or “Order and Progress” written on a band across the globe. The design has lots of meaning behind it. The colors are representative of past government leaders. The position of the glove is meant to represent the sky over the city of Rio de Janeiro, and the stars represent each state of the Brazilian Federative Unit. The current version has 27 total stars, while the original flag had just 21. It is within the law of the nation that the flag will be modified to add additional states. The flag features a green field. This represents to House of Braganza of Pedro I, who was the first emperor of the nation. The yellow rhombus reflects the House of Habsburg. A blue globe is centered in the middle of the flag featuring 27 white stars. As previously mentioned, the blue circle is meant to represent the night sky over Rio. The white stars represent the 27 states of the nation. A white band crosses through the center of the circle and features the nation’s motto in green letters. Originally, Brazil’s flag featured green and white stripes. This flag represented both the national colors of Portugal and the House of Braganza. This flag was flown until 1692 by Portuguese ships that came to Brazil. A new flag went into use in 1692 by these ships. It featured a white field with a golden sphere that was the emblem of King Manuel I of Portugal. These flags were used throughout the Portuguese Empire, but Brazil in particular used this flag quite often, including on its coins. When Brazil was designated as a kingdom in 1815, it used a different flag along with Portugal, and the Algarves. Following the nation’s Declaration of Independence, the Empire of Brazil received a new flag. The new designed featured the imperial coat of arms on the yellow rhombus atop a green field, similar to the flag of today. This flag was designed and used while Pedro I was emperor, and it was modified when Pedro II became ruler, adding an extra star to properly designate the territorial organization of the nation. The current design of the flag was used beginning in 1889. The only difference between the modern flag of today and the design in 1889 was the number of stars. This number has changed throughout the years, with the first change coming in 1960. Additional stars were added in 1968, and the current design went into use in 1992. When a Brazilian flag can no longer be used, it must be burned on November 19, which is Flag Day. The Brazilian flag is flown at half-mast when the president of the nation declares an official day of mourning. State and local governments also can make a decision to decree mourning following the death of a governor or mayor. Brazil has a Brazilian Flag Anthem, which is a song dedicated to the national flag. It is performed annually on Flag Day. The president and vice president of the nation have their own flags.